The beauty of natural stone tile adds timeless elegance to any kitchen or bath. Each tile of natural stone is different from another, making each countertop or surround a unique piece of nature's work. There are five types of stone you can choose from: marble, granite, limestone, travertine and slate. Each type varies in hardness and porosity. Your design consultant will be able to advise you on which stone types are better suited for each area you are considering depending on your needs and lifestyle. Natural stone tiles are created from giant pieces of stone that are removed from quarries all over the world. These pieces are then cut into slabs and eventually become the tiles that will make up your countertop or surrounds. Each stone has its own characteristics. 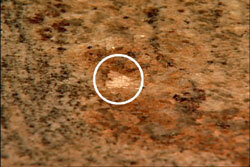 Irregular markings, shading, veining, and crystallization are considered normal and part of the beauty of the stone. The veining in your stone tiles will differ in direction from piece to piece. When each of these tiles are installed side by side on your countertop, wall or surround, the veining will not run in a consistent direction. The veining direction is dictated by the bull nose pieces of tile, the layout of the area and the tile setter. 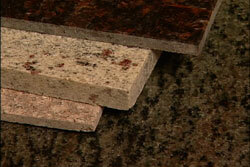 The tiles that make up your countertop or surrounds will not look exactly like the tile you saw in the design center. Additionally, if you select a combination of natural stone products, such as a stone tile backsplash or floor and the same color and type of stone slab countertop, they will not match. 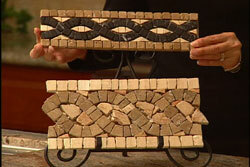 Also, please remember, it is not possible for you to hand select your natural stone tile. Natural stone tiles are polished or honed at the manufacturer's before installation to provide a smooth finish. Once installed there may be faint “cloudy spots” visible when viewing your countertop or wall tile from different angles and in certain lighting conditions due to swirl marks from the polishing process. No natural stone tile will have a perfectly smooth surface. Even after the tiles are polished there may be small chips or pits that may be apparent in different lighting. Fissures, often times mistaken for cracks, are not. These markings are normal and add to the beauty of the stone. 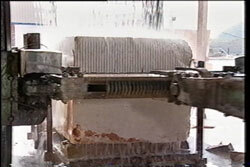 One type of stone that has a unique polishing process is Travertine. 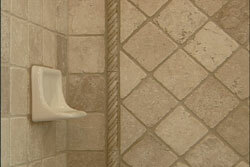 Travertine tile uses a “fill process that creates its unique look. In its original form, travertine has thousands of holes running through it which are filled and polished after the stone is cut. 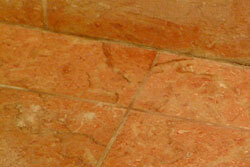 The stone portion of the tile polishes to a high sheen while the filled areas remain dull. The back of the tiles are rough from the filling process. This is normal and does not affect the quality of the stone. Being a natural product, natural stone tiles will vary more in thickness, squareness and length compared to man-made ceramic tile. 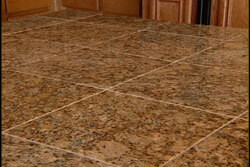 As a result, once your natural stone tile is installed it will not be a completely smooth surface from tile to tile. There are two types of edges that are used to complete a countertop: a bull-nose edge, which incorporates a slightly polished curved tile or a polished edge, that makes a 90 degree angle. 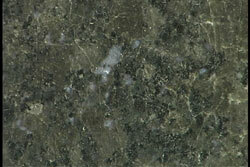 In the bull-nose edge small chipping will occur at the edges due to the density of the stone. This is considered normal. 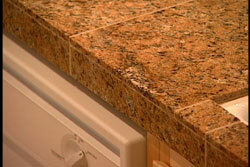 Natural stone liners, also called feature strips or decos, can add a customized look to your countertop or backsplash. 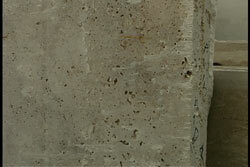 As they are a porous natural product, grout will fill the crevices of these stone liners and will affect their color. Like ceramic liners, many pieces do vary in thickness and width and do not always have matching end pieces. In some applications, when the field tile differs in size and shape from the trim pieces, the grout lines will not align. Once you have decided upon a tile you will then need to select a grout color. Grout can sometimes display uneven color or inconsistencies within the different areas of the same installation with the same grout color, or vary from the sample in the design center. This can be attributed to variations in temperature and humidity at the time of grouting. It is common to see slight differences in grout color when comparing the grout color in tile floor and the same color on the tile countertop or wall. Exact layouts, type of grout and grout joint widths are determined by the tile setter at the time of installation and are governed by the actual size and shape of the tile and the exact dimensions of the areas to be covered. Grout may darken over time in areas with heavy water use. Check with your Design Consultant for recommendations on products specifically designed to keep your stone tile and grout looking new.